We had a partial gathering of the clan yesterday to celebrate my son Michael Andrew's birthday. He came up from Lansing with his partner Micah, and my granddaughter Emma was still here with her mom Anne. Of course Margaret and I were present, and two dogs. Anne, who is a professional cook (and sometimes caterer) spent most of the day cooking a special meal, which included (everything homemade, of course) a cream of tomato and basil soup, a Ceasar salad, and personal pizzas made from carefully made focaccia bread, with mozzarella cheese, and covered with a special fresh red sauce, capers, banana peppers, and other stuff. It was great. And there was mint chocolate-chip ice cream for desert, which I did not partake of since I no longer like to eat sugar. Emma was very much on the scene. 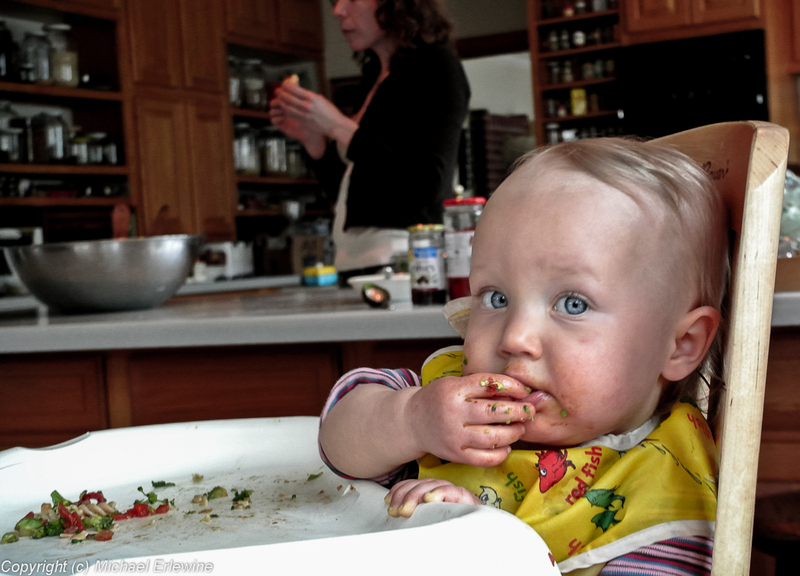 In this photo she is finishing up some pasta, broccoli, and most of all avocado, which she loves and calls "cado." Something else Emma loves is animals, and she has taken to feeding the dogs as soon as (or even before) she has had a little food for herself. Of course the dogs like this and like to gather at her feet and wait for Emma to drop food to them. The back of at least one of the dogs has begun to look like Emma's bib, spotted here and there with dropped food. It has been mostly raining for two days straight, and cold, but I know the rain will loosen things up and bring forth flowers, well, sometime in the not-too-distant future I am hoping… and some sunshine.